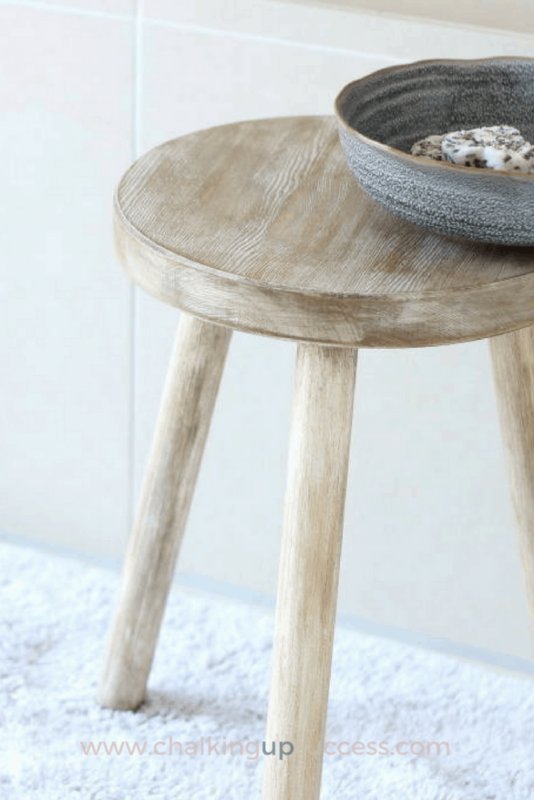 Wooden Stool For The Bathroom | Affordable & Unique - Chalking Up Success! This wooden stool is the smallest piece of furniture I’ve painted so far. That said, it’s also the piece that has caused me the most trouble! How can that be? I hear you ask, well, let me tell you all about it. I’ve been looking for a chair for our bathroom for a while now. The thing is though, I didn’t want something too big because I don’t like rooms to look too cluttered. 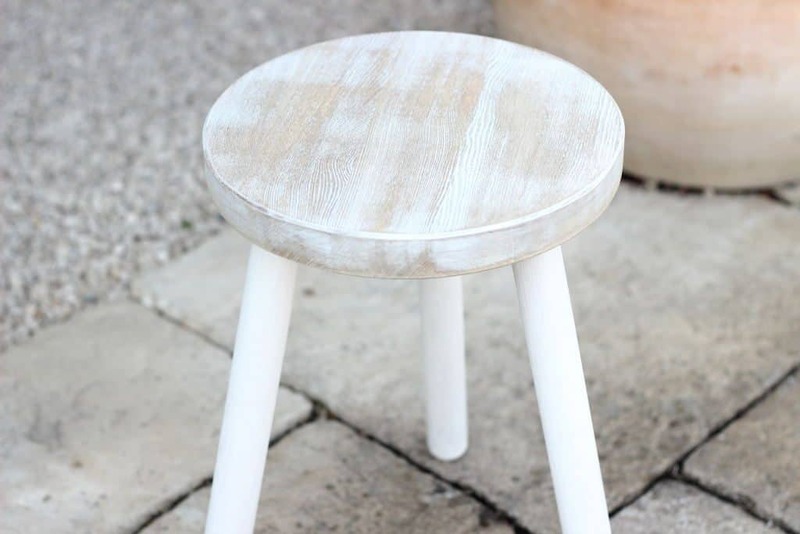 When I came across this little wooden stool in our local builder’s merchants I thought it might be the ideal solution. 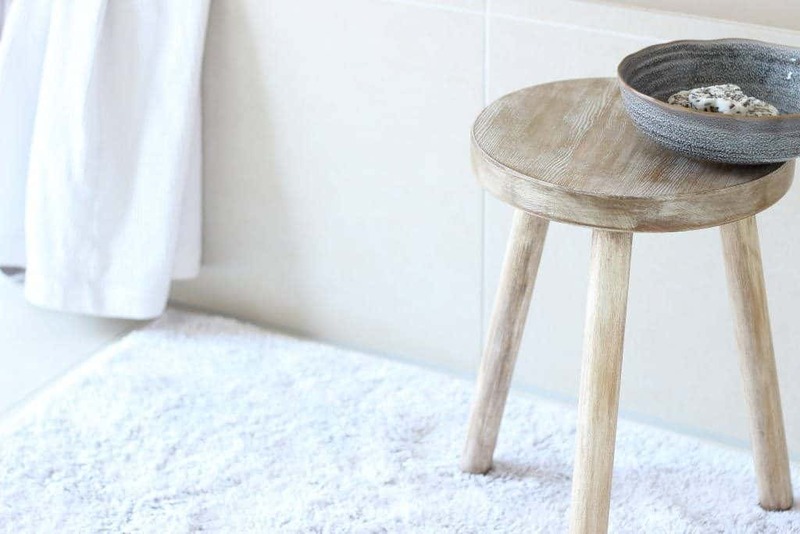 Something like this can be used for sitting or as a little side table – the perfect spot to stow your glass of wine when you’re having a soak! 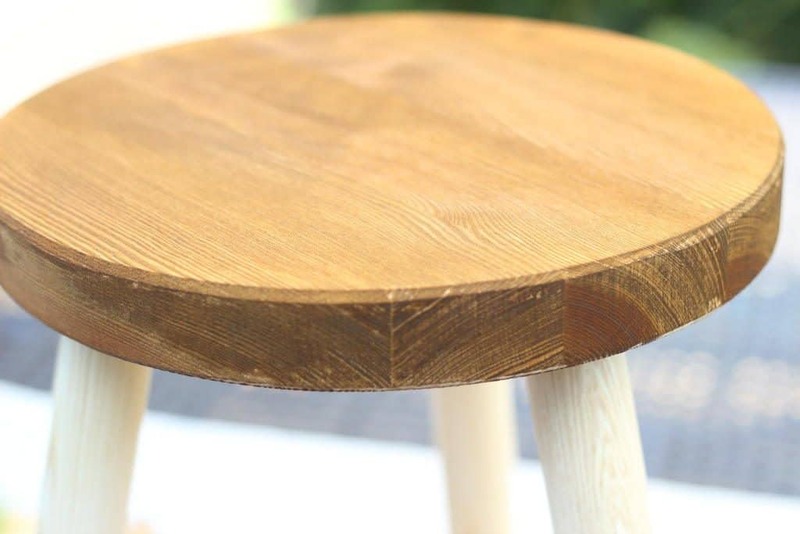 The stool was untreated bare wood when I bought it. I knew if I wanted this to be used as a bathroom stool I’d have to apply some kind of finish to it. I already had in mind exactly what I wanted to do and I couldn’t wait to get started on it. The first thing I did was to give the seat a gentle sanding with 120-grade sandpaper just to smooth it a bit. 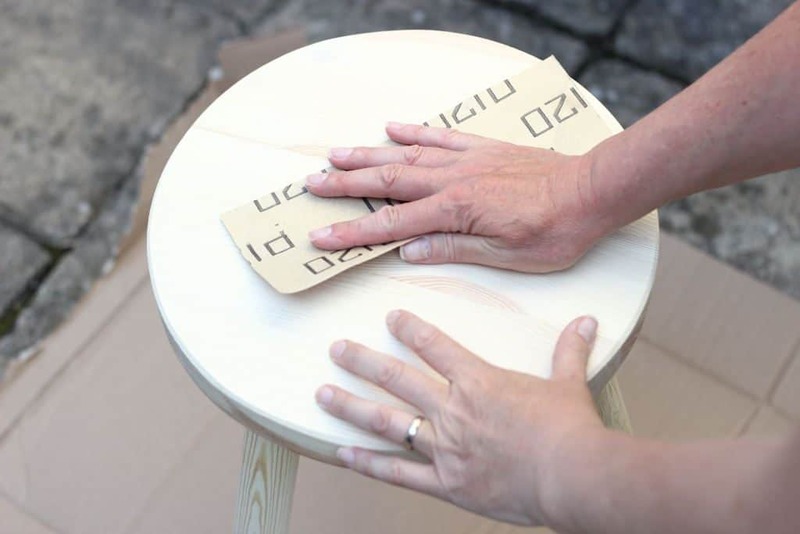 Then I wiped the stool down with a damp cloth to remove the sanding dust. I know you don’t need to see a photo of that but I’m including it anyway so you can see my little helper! Then, using a brush, I painted two coats of wood stain in ‘walnut’ leaving time in between for the first coat to dry. I can’t tell you how long to wait in between coats because it depends on which product you use. Make sure to follow the instructions supplied and you should be fine. 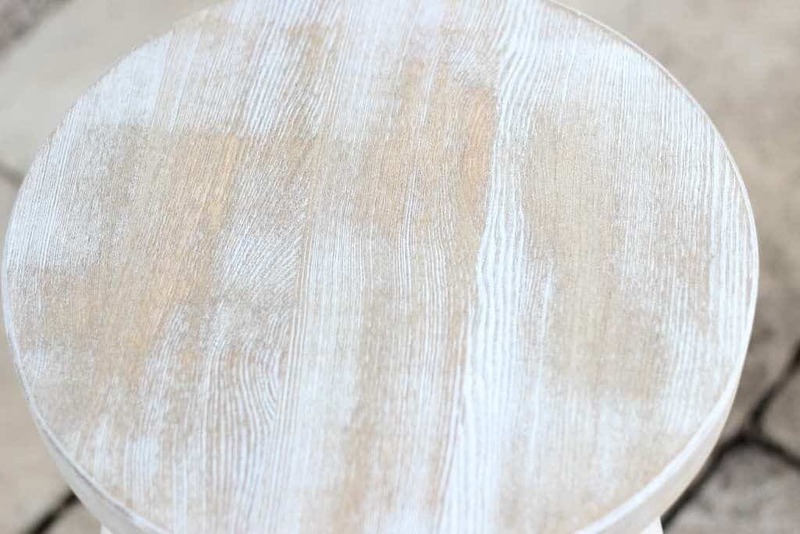 As soon as the wood stain was dry I painted the legs of the wooden stool with some chalk paint in white. Originally I intended to leave the legs white and have the seat stained darker but when it was done, I wasn’t happy with the look. It definitely wasn’t how I imaged my bathroom stool should look. You know, that’s the blessing of chalk paint, it can so easily be distressed or painted over to change the look. So then, I decided to use the chalk paint to ‘dry brush’ over the wood stain. It looked OK but it was still too dark for my liking. Then I decided to just paint the whole thing white and see if that looked better – It didn’t! I can tell you that by this time I was ready to give up, I was so fed up! 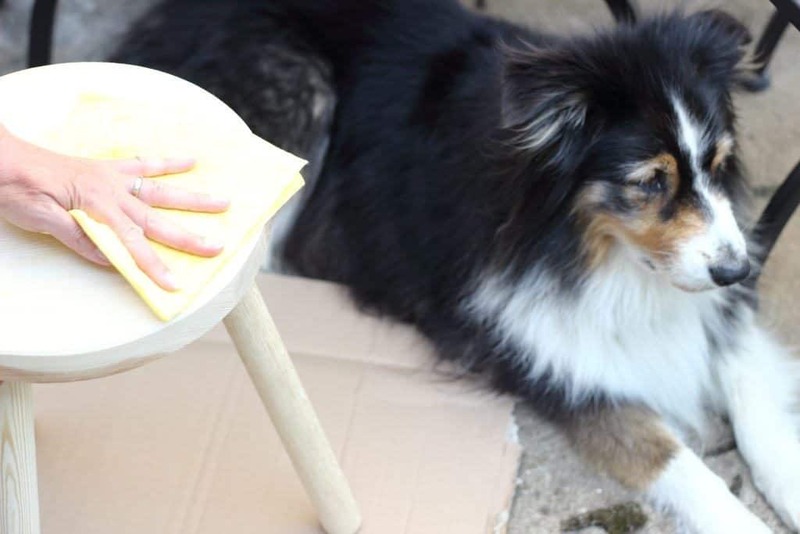 Of all the things I’ve painted, how could something as small as this wooden stool, cause me so much trouble? I decided to leave it overnight and ‘sleep on it’. 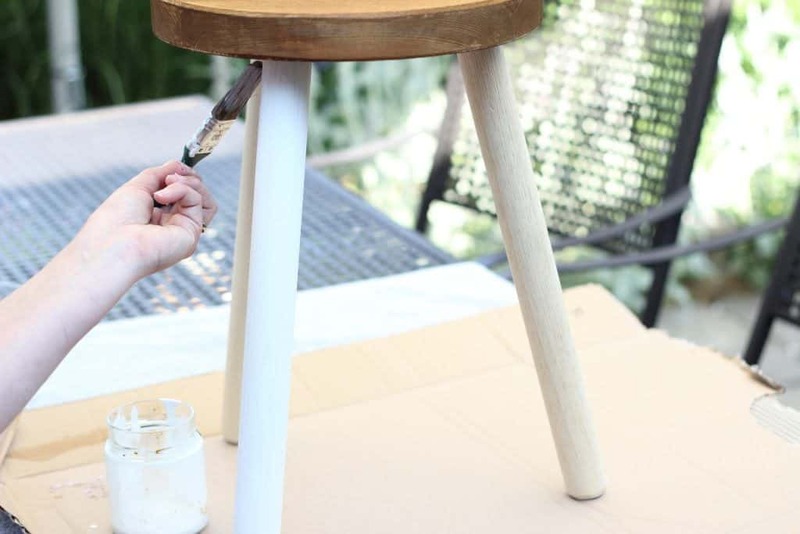 The next day, I was determined that this wooden stool was going to be finished and had an idea of how to create the look I was after. I think I was afraid that if I left it, I’d never go back to it and it would sit in our cellar half done for goodness knows how long! Here’s where my handy little sander comes in. I use it for small projects because I find it so easy to manoeuvre. It’s also light-weight so your hand doesn’t drop off when you’re having to hold it in lots of different positions. First I sanded the seat to see how that would look. I loved the look I was getting. Even though I was taking off a layer of the white paint, there was still enough paint left in the grain to give that ‘aged’ effect. After I’d finished sanding the seat, I realised that I’d taken off a little too much paint in one area and it looked a bit bare. To cover this, I used a lint-free rag to rub a little bit of white wax over that area. By the way, did you know you can make your own white wax? 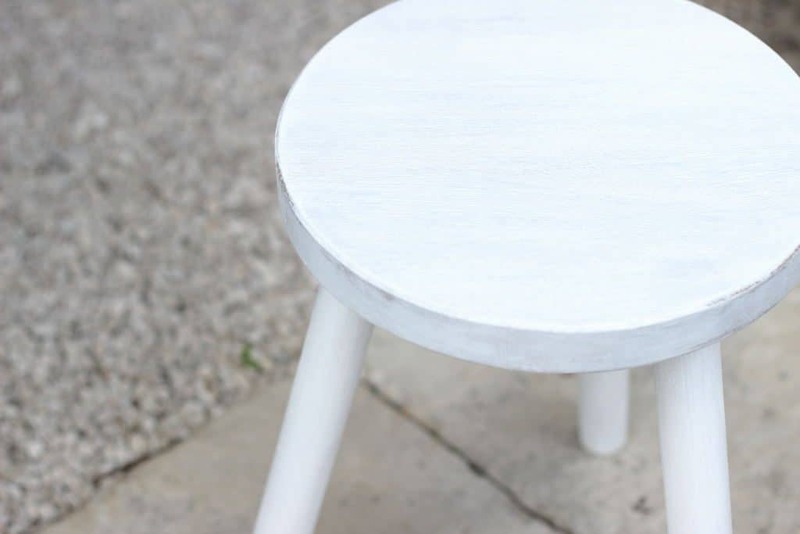 All you need to do is add a little white paint to some clear wax – easy! I used that method for my coffee table makeover too because I didn’t have any white wax at the time. Firstly, I used the sander to gently sand the legs so that some of the original grain showed through the paint. Once I was happy with the look overall, I gave the whole piece a wipe down with a damp rag to remove the sanding dust. Stage two | Leg Wax! The next step was to brush on a layer of clear wax. It’s important to use clear wax first even if you’re going to use dark wax later. 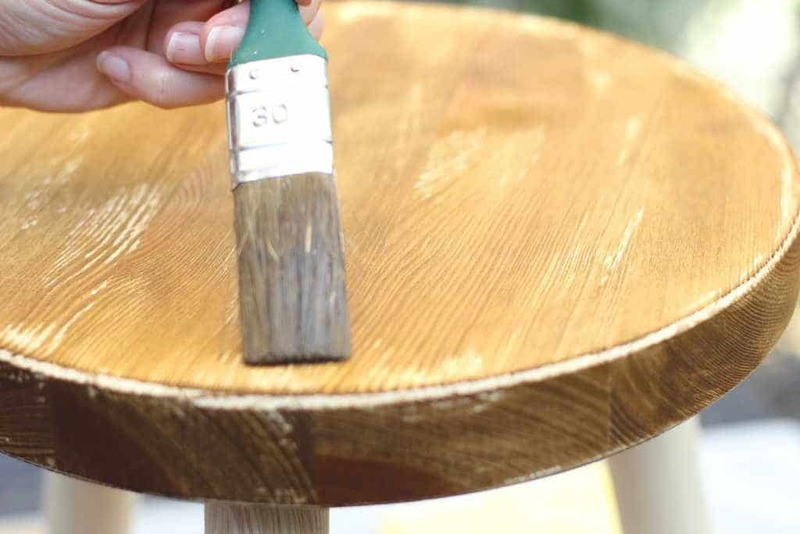 If you are not used to using wax, I really recommend you read my post ‘Riviera Maison Inspired Coffee Table Makeover’ which details how to use it. 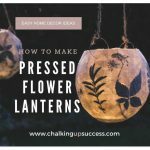 (Read the end of this post for details of a lovely free resource you may also love). After wiping off the excess wax, it was time to correct the colour so it fitted better with the colour of the seat. This is where the dark wax comes in. 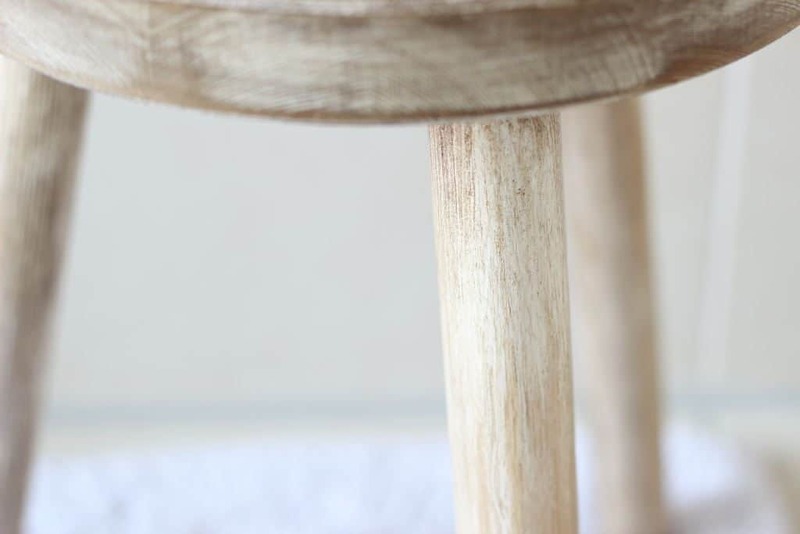 I don’t always use dark wax for ageing my furniture but I think it was the perfect solution for this little wooden stool. 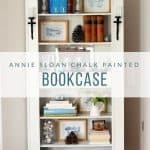 I mostly use chalk paint wax brushes to apply wax. I keep separate brushes for using dark or clear wax so that the colours remain pure. Using my ‘dark wax’ brush, I dipped it very lightly straight into the tin of wax. 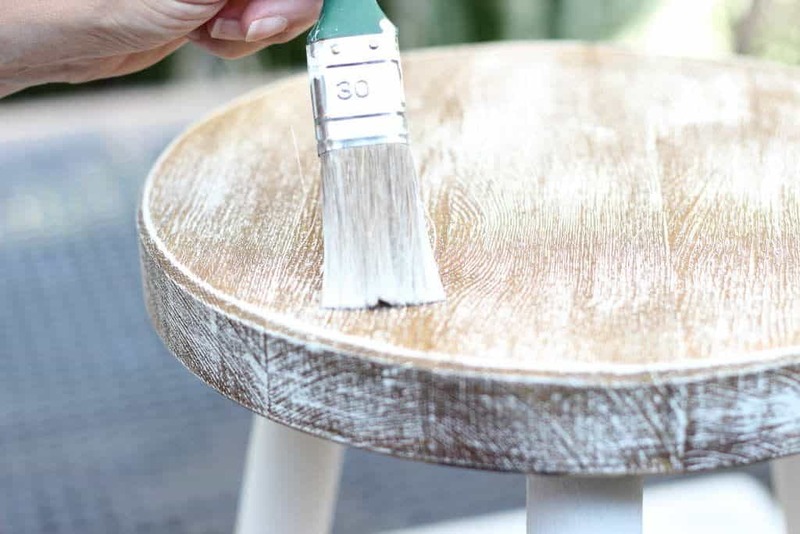 Then I gently flicked the brush over the stool so that I wasn’t adding too much and could gradually build up the colour until I was satisfied with the look. If you do this and you think you’ve added too much dark wax in places (which happened to me), you can easily take some off again. 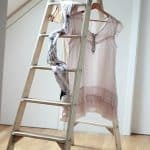 To do this, just take up some clear wax on a lint-free cloth and rub over the area in question. That’s also why I said it’s important to use a layer of clear wax first. If you don’t the dark wax will stain the wood making it hard to remove. 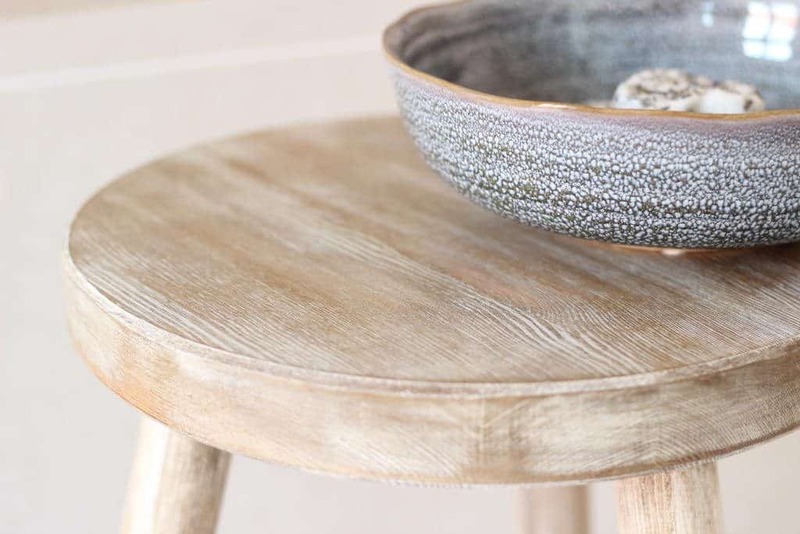 Like I said though, read the post ‘Riviera Maison style coffee table makeover’ for a better description of how to use wax. I left the wooden stool overnight as it was and the next day I brushed on another layer of clear wax. This was going to be a bathroom stool remember and although it doesn’t have to be waterproof, I definitely wanted it to be water resistant. After brushing on the clear wax, I wiped away any excess with a rag and left the stool overnight again so that the wax could harden a little. In the morning, I used a clean rag to buff up the wax until it had a lovely lustre – finished! Well, what do you think? 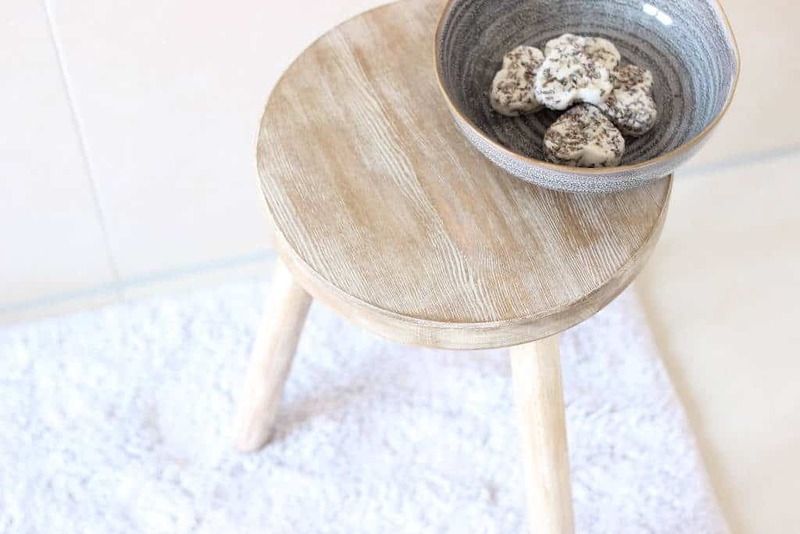 Do you like my little wooden stool? I’m seeing these all over Pinterest these days but my, they’re so expensive. Now you may be thinking, “Yes, but what about all the products you used?”. The thing is, I didn’t buy anything new for this project. I used products that I already had left over from other projects. When you think that just one tin of wax can be used on so many furniture pieces, that spreads the cost and also means you use up every last drop! I know some of you may be nervous about starting a project like this for your home and I can understand that. 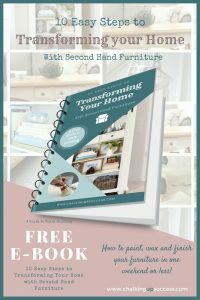 That’s why I have a lovely free resource for you which walks you through how to transform your home with second-hand furniture. 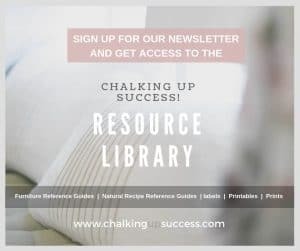 All you need to do is sign up for the Chalking Up Success weekly newsletter and you’ll receive a free e-book directly to your inbox. 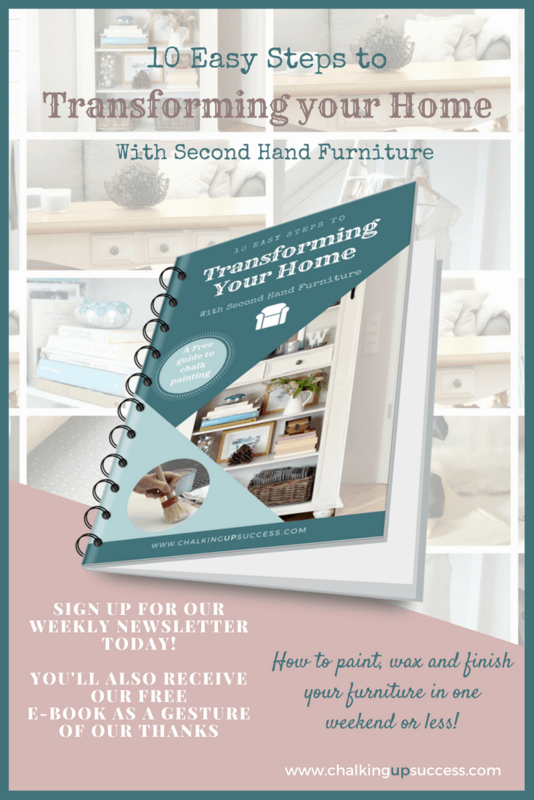 That’s not all though, over the course of a few days, you’ll receive even more helpful tutorials like ‘How to find your Style’ and ‘ways to create the weathered look for furniture’. 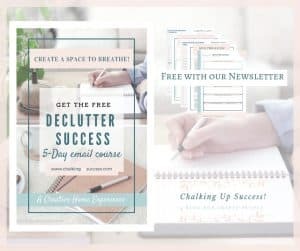 If you’d like to know more about the free e-book, just click the image below which will take you to the information page and sign-up form. Alternatively, you can just use the newsletter sign-up form at the bottom of this page to get started straight away. I hope you like it and that it brings you a step closer to creating a haven for your heart! 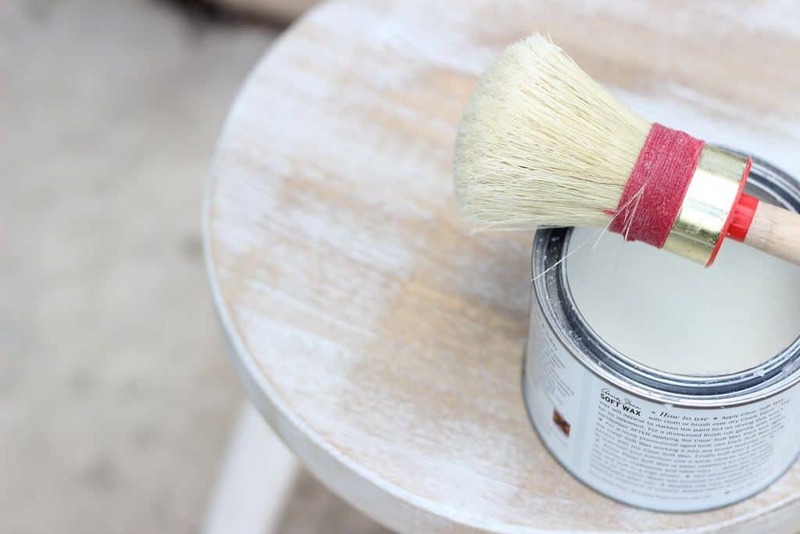 Here’s to a gorgeous home for all of us – happy painting! Thanks Carolyn, it’s amazing how easy these are to make too – finished in minutes! Your stool turned out great! Well worth the time it took- it’s perfect! I’m glad you like it Allison, it’s perfect for me that’s for sure! 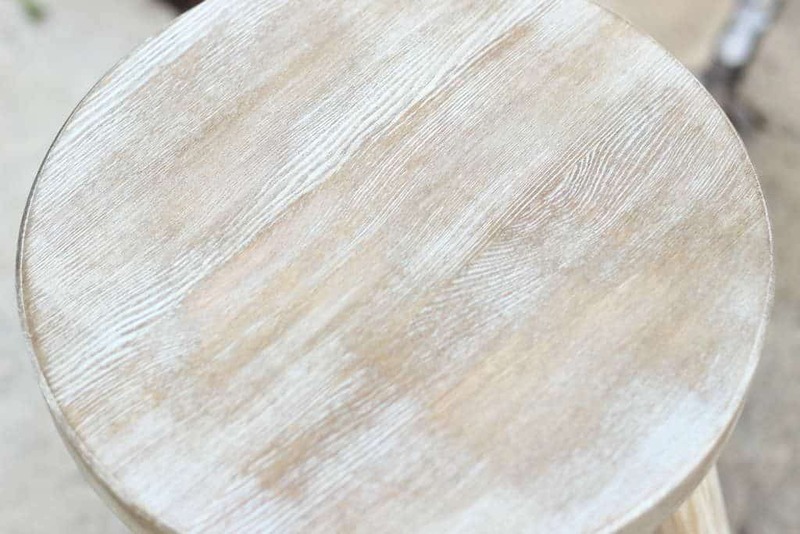 I love the finish you put on the stool! More of a country farm house feel. Love it! 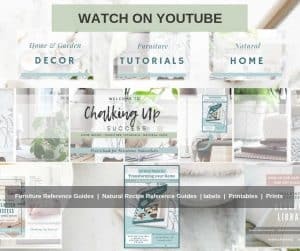 thanks Candice, the country farmhouse feel is exactly the look I was trying to achieve!